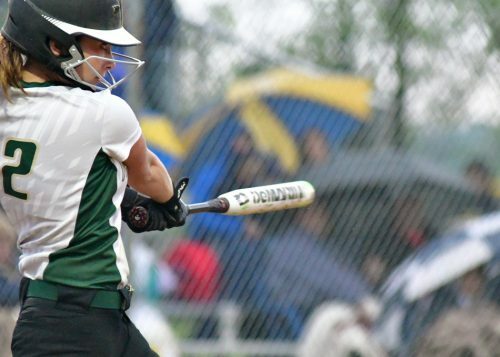 LAGRANGE – A foul ball might have been the best thing to happen to the Wawasee softball team. 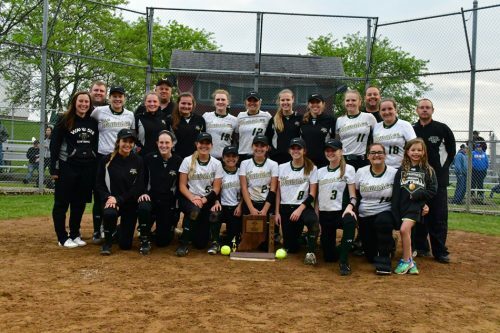 Needing a spark from the middle of its lineup, a well-struck foul ball in the first inning by Hannah Haines was a minor wake-up call for Wawasee in the championship game of the Class 3-A Lakeland Softball Sectional. 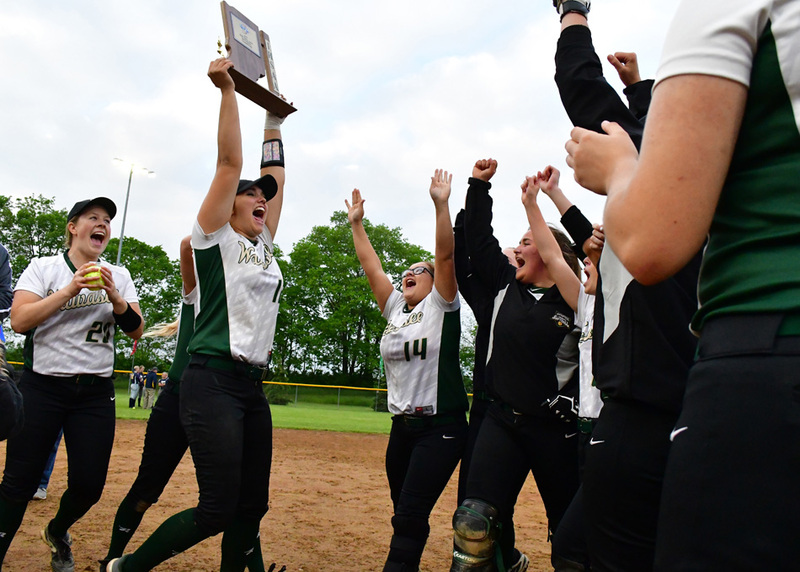 Haines and the offense came alive in a 12-3 win over Fairfield, giving the program its sixth sectional championship. 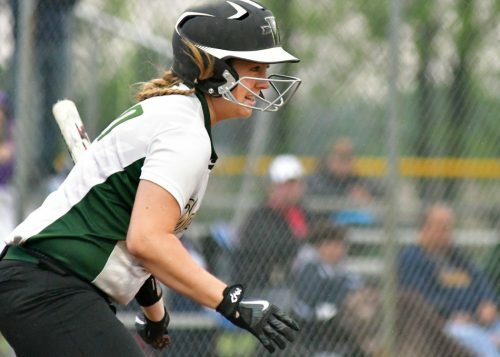 Haines, who had just one hit in her previous 10 at bats and had just two RBIs since April 29 from the cleanup position, came through with a pair of hits and an RBI single as part of an eight-run fourth inning that blew the game wide open. 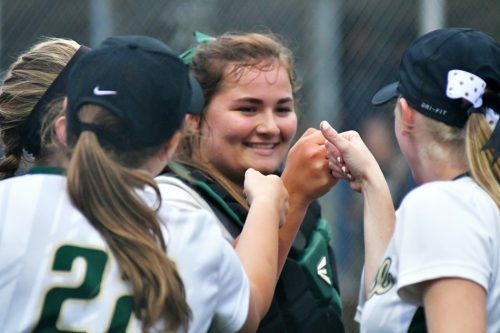 The relief on Haines’ face in the fourth, which the RBI gave Wawasee a 7-1 lead, was a welcomed sight to a Lady Warrior side that just kept the line moving in a stunning fourth inning. Hannah Haines smiles after smacking an RBI single against Fairfield. Wawasee got two runs in the first, Ale Brito coming home on a late throw back home on a dropped third strike, and Kayla White scoring on a wild pitch. Those runs held to the fourth, where Samantha Shank got Fairfield going with a solo shot over the left field fence to cut the lead in half at 2-1. In much the same way Wawasee overwhelmed Lakeland and West Noble with big innings, they did it to Fairfield with a snowman in the fourth. White started the rally with a two-run single, then Madie Wilson, Meghan Fretz and Haines followed up with RBI hits. Amber Lemberg added a sacrifice fly and an error off the bat of Faith Swihart brought in two more runs. That uncomfortable feeling in the No. 4 team in the state’s dugout quickly switched to eager anticipation. Brito and White each had three hits and combined to score six runs. Fretz had two hits, a walk and three RBIs and Beth Flannery reached base three times and scored a run. Wawasee had 16 hits in the game and 36 total hits in the three-game sectional. Fretz, the workhorse in the circle for Wawasee, labored in the fifth, allowing Fairfield (10-11) to get a pair of runs back when Jenean Schwartz doubled in two. 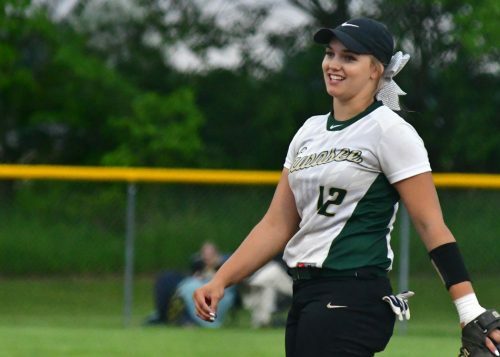 But the senior ace got out of the jam, then kept the scoreboard clean in the final two innings to send Wawasee to the regional for the first time since 2014, when Fretz and the senior class of nine were just freshmen. Fretz allowed five hits and two walks while striking out four. The defense behind her was solid again, committing just one error in the game, its only miscue of the tournament. That note was important to Barger in his team’s success. “Defensively, we are playing as well as anyone. I’ll stack my team up against anyone right now with the way we are playing defensively,” Barger noted. Wawasee moves to 24-3 overall and will await its opponent in the regional, with Fort Wayne Dwenger (18-7) and Fort Wayne Concordia (18-7) set to meet Saturday night in the Angola Sectional championship. Wawasee will travel to Fort Wayne to meet the winner in a one game regional Tuesday night at 7 p.m.
Wawasee’s Madie Wilson take a cut against Fairfield. Wawasee’s Meghan Fretz reacts after a strikeout. Wawasee catcher GraceAnne Kerlin gets some love after throwing out a baserunner.